Day one was always going to be a challenge. We had just finished up doing 6 shows in 7 days, including launching shadowbox to an awesome audience in Baddeck. 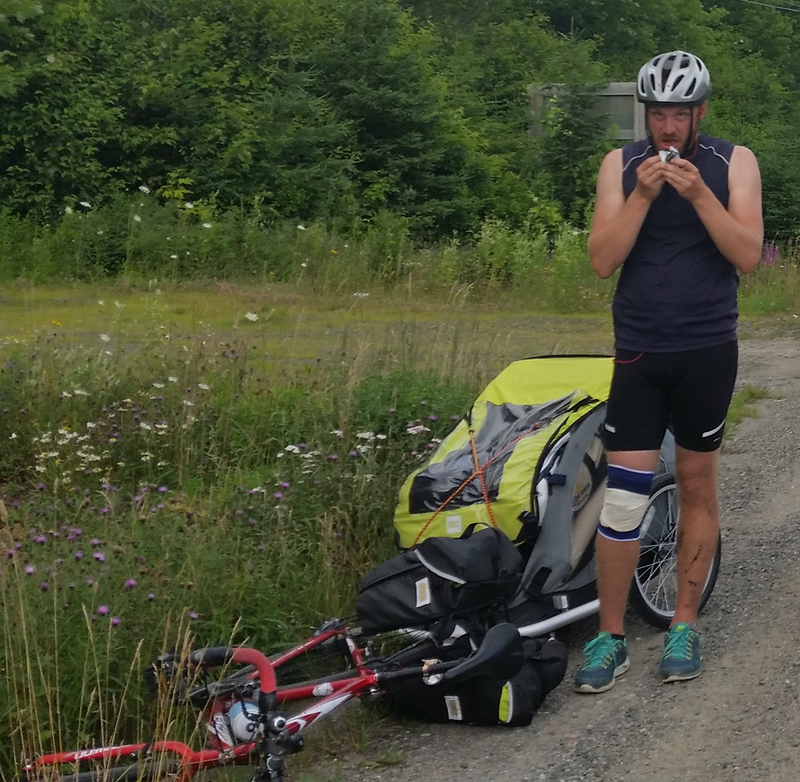 We were tired, and the prospect of biking 90 kilometres on the first day… on Cape Breton hills seemed like… a lot. As a “veteran” of bike opera I was nervous for what I knew was coming. The hills, the length, my complete lack of conditioning. The ‘newbies’ had different fears. Will I keep up? Will I be able to do it? It all started off as we remembered it, packing the trailers… getting on the road. It felt comfortable… familiar. Bell signals and hills alike. Our fearless leaders: Larissa, smiling her huge “I love bike opera” smile, and Geoff, the workhorse, saddling up his clearly overloaded trailer without complaint. It was all going well. A spoke doesn’t seem like a big deal. But when it breaks… it’s not the best. It was my spoke that started the events that sent the day into crazy town. We had prepared for the possibility, but of course it was a spoke in the wrong position and we didn’t have just the right tool for the job (crazy specific bike tools). So we were left on the side of the road with 7 and a half bikes… and 8 people. Luckily this started a trend of amazing people stepping in to save the day. The first heroes were Petra and _______ who scooped me, and my bike up and drove me into the next town. There we all met up to ponder the next move. I won’t bore you with the endless details of my story, but within the day I was shuttled 100s of kilometres in three different stranger’s cars. Met some of the most generous, kind people I have had the pleasure of interacting with (and one beautiful Husky). I bought a new bike wheel (apparently one spoke wasn’t the problem), and chalked the day up to one of the luckiest unlucky days of my life. Meanwhile back with the group things were getting more topsy turvy. 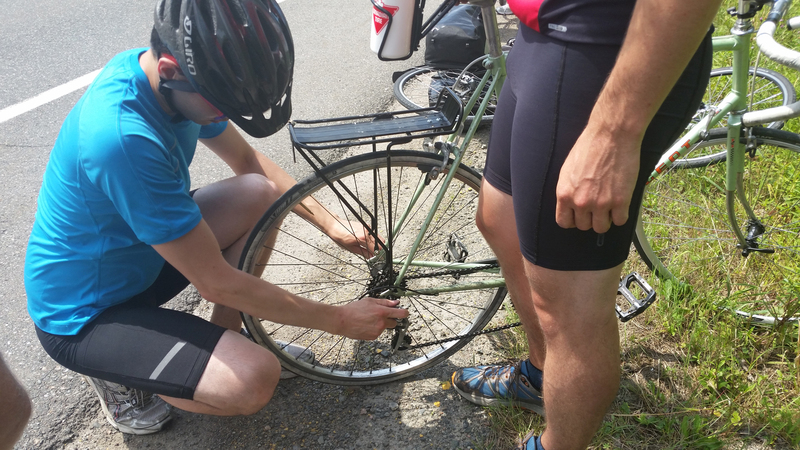 Spokes are important, but knees are way more important. And of course the knees of the guy hauling the heaviest trailer are the most important of all. Now, it’s tough to explain how incredible Geoff’s tolerance for pain is… but just know that it’s very high, but at one point (allegedly: remember… I was 60 km away meeting my new Husky friend) he was biking with only one leg, the other crossed over his crossbar up a hill. Picking up the slack was the rest of the veteran team. Larissa and Wes who hauled trailers… and STEPH!!!! Who rocked out a trailer for the FIRST TIME and totally killed it up some particularly nasty hills. I was worried about whether I’d keep up, or even be able to do it at all. Well… if our newbies were worried about those things they sure put it all to rest. Not only did they “keep up”…. They freaking killed it. Our newbies led the pack, charging up hills and leaving the rest of us behind. 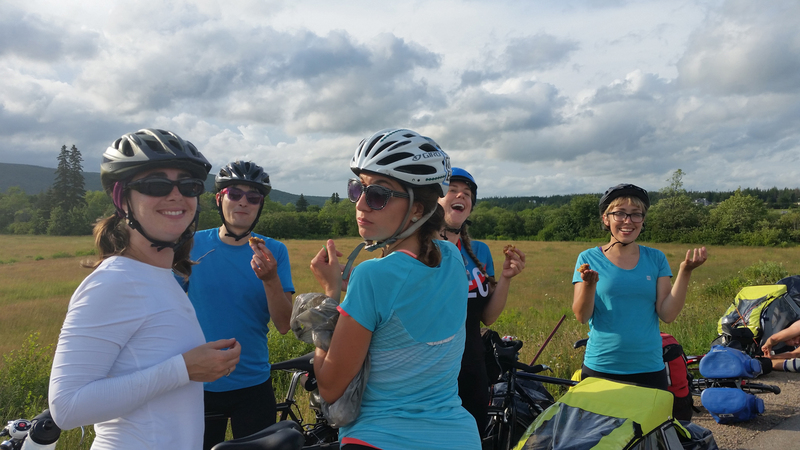 They went 90 kms on their FIRST DAY OF TOURING… with some crazy hills. So…. We had some bad luck today… but it wasn’t a bad day. 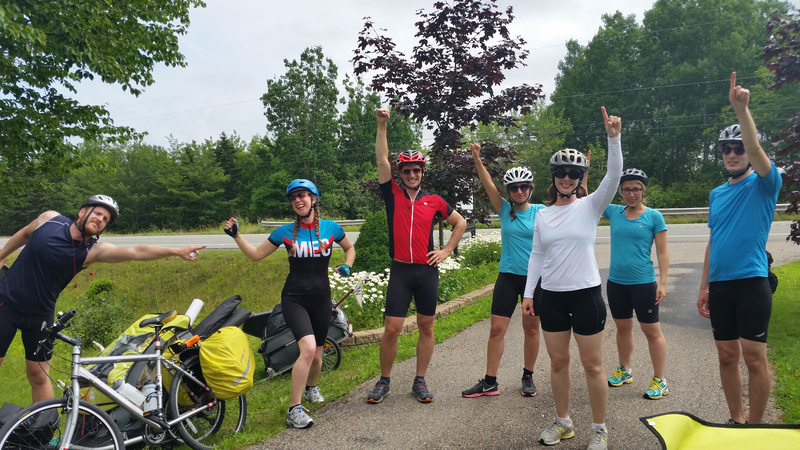 It’s a testament to community that even when things get turned on their heads, people step up… both the folks in our Bike family… and the people that we’d never met before (welcome to the Bike Family). So, if you’re an awesome person and you find yourself near Port Hawksbury, come to our show tomorrow night at 7. I think if anything is clear after today it’s that we will do WHATEVER IT TAKES to put on this show for you.